…She is weary, weary of body, weary of spirit and weary of heart. She is weary not from corporate battles or legal wrangles, she is not weary from pursuing her right in life, or adding to her career. Her weariness does not come from over exertion in pursuit of a firm body or from pursuing her own lifestyle goals. 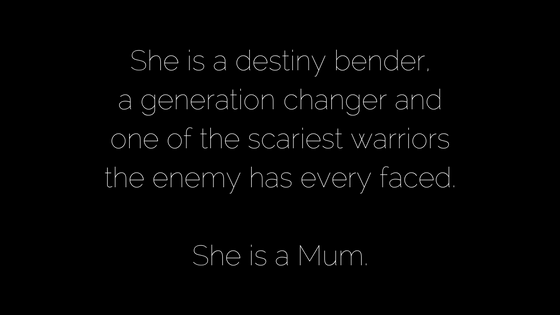 Her wariness comes from the front line battle; she is a weary warrior, a warrior on the front line. My friend stands with a directive from the King, her armour on, her sword at the ready, her stance defensive and…. she does the washing, cooks dinner and loves the little people God has brought into her life. To all appearances my friend looks like the mother of young children, but in reality, God’s Supernatural Reality, she is a destiny bender, a generation changer and one of the scariest warriors the enemy has every faced. And with every act of kindness when she is overwhelmed, and far beyond herself, she brakes enemy strong holds. With every deep breath, followed by a word of wisdom supplied by Grace she is shaping and moulding the next dynamic generation of Gods Kingdom people. With every sacrifice of self, she robs the enemy of what he wants most – hurt, alone and damaged children. She is laying down of her own life, for her children. She gives up so much, so much of herself, her needs, her wants, her time, her energy and she does this to impact tomorrow, and SHE IS impacting tomorrow beyond even what she is aware of. Her daily tasks are having eternal consequences with heavenly rewards. Hang in there warriors, you will be victorious!